Our House Filing Box. Organize all your bills, receipts, bank statements ... let any part of your particularaccounting. Available in two sizes and two colors. 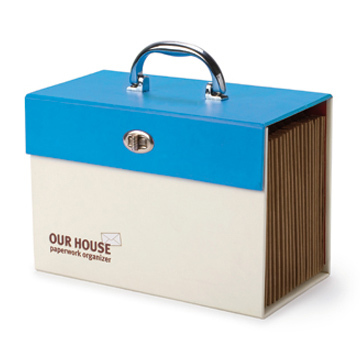 Elegant and practical file cabinet for your home. Organizes and saves all those papers you've always got lost in the drawers. Available in two sizes A5 and A4, and also in two colors, red and blue. The filer has 19 sections A5 and A4-size file cabinet has 21 sections.